New York, London, January 30, 2018 –– TRG, the leading provider of subscription spend management software solutions, today announced it has agreed exclusive global distribution rights for DART Terminal Usage Analytics with Vela, the leading trading and market access technology provider. Note: This agreement does not cover DART Entitlements which will continue to be developed and supported solely by Vela. TRG provides spend management solutions enabling enterprises to gain total cost transparency and control of their entire universe of corporate subscriptions and vendor relationships. Founded by senior IT executives from global investment banks in 1998, TRG provides software and services which help companies streamline their expense management, reduce costs, and make informed decisions about spend on subscription-based services including market data, software, research, information services, consulting, and more. TRG’s clients manage billions of dollars in recurring costs using TRG’s advanced expense management and usage tracking platforms. Vendor contracts, procurement, invoicing, and expense allocations can be expertly managed, providing detailed reporting down to the employee-level, enterprise-wide cost transparency, and accurate control of all commercial and financial relationships with vendors. TRG’s usage tracking capabilities allow detailed tracking and analysis of service usage patterns allowing clients to optimize their vendor spend. TRG’s unrelenting commitment to exceeding clients’ expectations, coupled with deep business and technology expertise, has earned it a reputation for delivery that is the envy of the industry. With client retention rates over 95% and numerous competitor product displacement success stories, TRG provides the industry’s highest quality, most trusted solution with the highest level of service to match. Vela is the premier market access technology provider, delivering low-latency access to over 200 venues, coupled with a unique set of trading tools, data, and analytics, flexibly delivered with exceptional global support. Vela acquired OptionsCity Software and Object Trading in 2017. 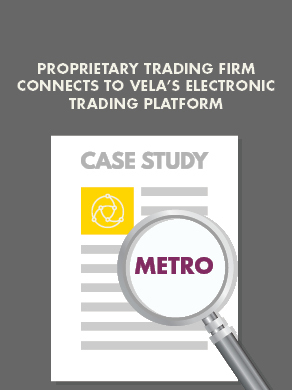 Now as one organization, Vela provides a comprehensive, end-to-end solution for multi-asset electronic trading with global market coverage. Vela has multiple offices in the US, Europe, and Asia supporting traders, market makers, financial institutions and other market participants worldwide. Visit us at TradeVela.com. Follow us on Twitter @TradeVela.